(Reuters) – A rise in Apple (NASDAQ:) led a rebound in technology shares and boosted all three major stock indexes on Thursday, while trade worries eased after China said it was open to fresh talks with the United States. The bluechip touched its highest since Feb.1 and is just about 2 percent short of all-time high hit on Jan.26. The and the Nasdaq had already moved past their January peaks to record highs in prior weeks. The technology sector climbed 1.38 percent on the day, the most among the 11 major S&P sectors, boosted by Apple’s 2.9 percent jump. Apple, which has said tariffs could hit a “wide range” of its products, fell 1.2 percent on Wednesday when it unveiled its largest-ever iPhone, but made only small, widely expected changes to its line-up. “It is a risk-on environment today and if risk is truly going to be on, then technology is definitely going to lead,” said Michael Antonelli, managing director, institutional sales trading at Robert W. Baird in Milwaukee. Trade worries softened after the Trump administration invited Beijing for a new round of talks, even as Washington prepared to slap tariffs on $200 billion worth of Chinese goods. The timing of the talks remains unclear and President Donald Trump said in a tweet there is no pressure to make a deal. “The fact that China is willing to talk is good. Hopefully there is a bit of normalcy returning to the markets because seems as though Trump’s tweet at this point is largely just noise,” said Rick Platte, chief investment officer of Schwartz Investment Counsel. Trade-sensitive industrial sector rose 0.53 percent. Caterpillar (NYSE:) was up 0.9 percent and Boeing (NYSE:) rose 1.0 percent. At 12:34 a.m. 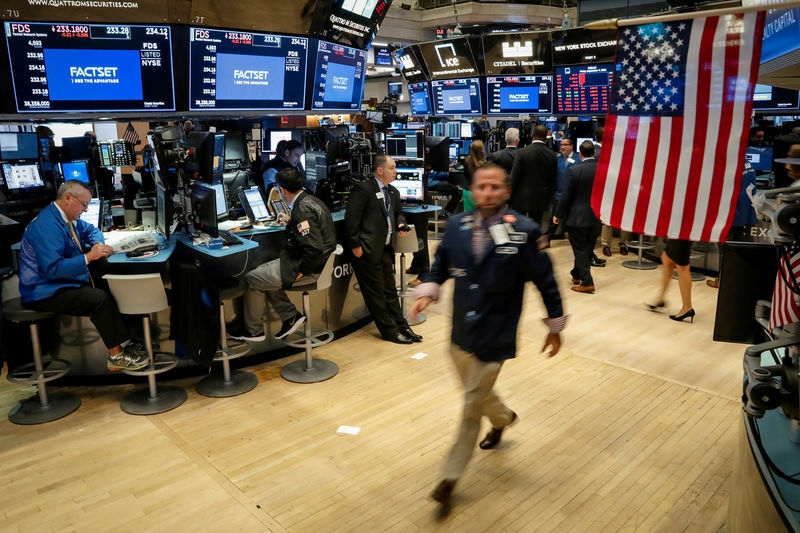 ET the Dow Jones Industrial Average was up 139.59 points, or 0.54 percent, at 26,138.51, the S&P 500 was up 15.19 points, or 0.53 percent, at 2,904.11 and the was up 72.78 points, or 0.92 percent, at 8,027.01. On the economic front, U.S. consumer prices rose less than expected in August and underlying inflation pressures also appeared to be slowing, a report from the U.S. Labor Department showed. “Tame inflation data is a net positive for markets and this shouldn’t change the Federal Reserve’s decision for two further rate hikes this year,” Antonelli added. Two S&P sectors were trading lower, with the defensive consumer staples dropping 0.5 percent as shares of Kroger (NYSE:) weighed the most on the sector. Kroger slid 10.2 percent and was the biggest decliner on the S&P after the supermarket chain’s same-store sales missed estimates as customers were put off by changes in how it stocked merchandise. Qualcomm (NASDAQ:) rose 4.0 percent after the chipmaker said it would buy back about $16 billion of its stock. Chipmakers bounced back from a slide on Wednesday, with the Philadelphia semiconductor index up 2.21 percent. Advancing issues outnumbered decliners by a 1.70-to-1 ratio on the NYSE and by a 1.32-to-1 ratio on the Nasdaq. The S&P index recorded 56 new 52-week highs and two new lows, while the Nasdaq recorded 107 new highs and 40 new lows.